Q. In a stroke-play event, the winner's prize is awarded to B. The next day A advises the Committee that he had returned a lower score than B. A check reveals that A is correct and that, in error, the Committee had failed to post A's score. What should be done? A. Rule 34-1b does not apply to Committee errors of this kind. The prize should be retrieved from B and given to A, the rightful winner. Of course, it is rare for Committees to make mistakes! With the Open Championship starting at Royal Lytham & St Annes on Thursday, I would like to draw your attention to the four short video clips that the R&A has posted of breaches of the Rules that occurred at previous Open Championships staged at the same venue. Click here to view the R&A videos. I am delighted to note a surge of new subscribers to my blog over the past month. You are very welcome. I recommend that you also subscribe to my free, weekly email ‘Rhodes Rules School’ photo series. Click here for more information. What happens when player, marker, and official confirm, agree, and sign a player's scorecard with a gross score in a tournament, then player's score is posted on the leaderboard. The next day one of the scores is changed on a certain hole changing the original gross score that was signed by all three parties? Is this allowed? Can player appeal? Unfortunately, you do not say why the Committee changed the score on the score card that the player and marker had signed and returned. Presumably they had evidence that the score was not correct and in case of dispute the Committee's decision is final, Rule 34-3. If the Committee decided that a competitor had signed for a score on a hole lower than was actually scored the player should have been disqualified, rather than having their score on the round adjusted, Rule 6-6d. Hi Barry. Does sending out the results to all competitors by e.mail 24 hours after comp ends qualify as the competition being closed? I think that most people would regard that as official notification of a competition? What do you think? Yes, in my opinion emailing the results to competitors would certainly indicate that the competition has been closed. In fact, if the result had been posted on a notice board before the emails were distributed, this would also be evidence that the competition had closed. After play but before the competition closed, a player reported to the committee that a fellow competitor added a club to her bag during the round from the bag of another player. She reported it to one of the committee members in the scoring area and the committee member said it was not a violation and the entire committee did not give a ruling or even hear about it. The competition then closed. Is there anything that can be done at this point? From the circumstances you describe the Committee member's decision seems very irregular. But it is possible that they had more information on the incident than others that were not involved; for example, it is possible that the player had mistakenly put one of her clubs in another competitor's bag earlier in the round. My recommendation is that you formally ask the Committee to explain why one of their member's appears to have waived a penalty incurred for a breach of a Rule. The Committee could retrospectively disqualify the player concerned, if they were aware that a penalty had been incurred before the competition closed, Rule 34-1b(iv). The player concerned (A) switched the clubs with another player (B) during practice. Knew she had switched it but played with player B's club for the first three holes. Player B, realizing the error, gave the club to the marshal and the marshal returned Player A's club to her and took Player B's club back to her. Both finished the round with their own clubs. Neither player knew they were in breach of Rule 4. Can the committee now, after the competition is closed, go back and assess the penalties involved? I believe that would be four strokes to each player. Sorry I was not very clear. Since they did not know the rule can you still apply 34-1b(iv)? In my opinion, because the players were not aware that they had incurred a penalty and the results of the competition had been announced, the result should stand. This is reinforced by the fact that the marshal/referee/Committee member (?) had sanctioned the change without drawing the players' attention to the breach. You should not have been disqualified from the competition. The Rules do not specify where the player must sign their score card (Decision 6-6b/2), or perhaps surprisingly, when they must sign it. Obviously, it is preferable for players to sign their cards after they have completed their round in the space provided on the score card, but they should not be disqualified for not doing so. As to what action you should take I can only suggest that you make your case to the Committee who should reverse their ruling. 1.Can a player be disqualified for round 1 after round 2 has been finalized, out a 3 round tournament? 2. Can a player be disqualified if all other 3 competitors confirm and agree on a ruleing that is wrong for the player? After both marker and player signed the scorecard and results of round 2 have been posted? 1. Yes, depending on the circumstances. 2. Yes, depending on the circumstances. The competition is not over until the 3rd round has finished and the results have been announced. However, there are exceptions depending on the circumstances and you should read Rule 34-1b and the Decisions on that Rule, to reach an accurate ruling. If you would like to provide me with the circumstances off-line, you can email me at rules at barry rhodes dot com. Hi, first time question, so forgive if this has been covered before. R34.1 b (iv). Is "knowledge" in this rule subjective or objective? ie, Is a player deemed to have as much knowledge about rules as everyone else or, do a committee have to show that an individual player had actual knowledge about the specific rule/penalty incurred? Thanks. In my opinion, the Committee should not impose a penalty after the competition has closed unless they have evidence that the player was aware that they may have incurred a penalty, e.g. someone had mentioned that there could have been a penalty situation before the score card was returned. Rule 34-1b(iv) does not assume that a player must know a Rule just because it is in the Rules book. Hi Barry, first time question here. I recently played an open singles stableford competition in an away club and returned a high score. This was on Sunday just past. On Monday I played an open of the same format in my home club off the same handicap. To my knowledge there had been no amendment made to my handicap from Sunday as I was aware. It turned out that I had finished in second place in the 'away' open and I subsequently was announced as winner of the 'home' competition. Later this week I learned that I had been disqualified from the home competition under rule 6-2(b). Your thoughts would be great! Unlike the Rules of Golf, which are unified across the world, there are a range of different handicapping systems used by national golfing bodies and I do not have expertise in this area. You should try and access the handicapping system regulations for wherever you play your competitive golf. Bad weather is not of itself a good reason for a Committee to declare a competition null and void. They should only do so if the course is not in a playable condition, typically when a hole on a putting green is surrounded by water, so that proper relief from casual water on the green cannot be obtained. 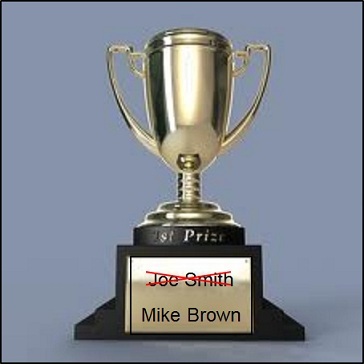 Committee error in awarding a prize to a player in a stroke major competition. Person who should have won prize brings it to the committees attention after about 3 weeks. Committee make contact to apologize (human error) and hand over prize taken back from announced winner. Person who should have won asks that it be presented at a prize giving ceremony in front of fellow competitors. Committee make a decision to hand it over after prizegiving ceremony is over to a person nominated by rightful winner who is unable to attend. Right full winner annoyed and brings it to the attention of members that this was unfair and should have been done in public as she asked, and as was done for all other prizewinners on the night. I value your opinion and wonder about Rule 34b-6 in relation to this matter. It seems to me that the Committee corrected their error as recommended in Decision 34-1b/6, in that the prize wrongly given was retrieved and awarded to the rightful winner. I am not going to comment on the Committee's decision to hand over the prize to a nominated person after the prizegiving ceremony, as this is not covered in the Rules and they may have had a good reason that I am not aware of. I would value your opinion on the following. Following completion of the second round of a 36 hole scratch stroke play competition a player did not sign his second round card. The player was not a winner but in the top 8 which qualified him for the club championship quarter finals along with the other seven. The result of the qualifiers was emailed to the whole of the club and the player in question received a phone call to confirm qualification of the quarter finals. The quarter final was played and the player in question won his match to progress to the semi final. Having shook the opponents hand and that of the match referee, the player was approached by a club official to say that he was disqualified for not signing his second round card. The player in question was shown his second round card, which he clearly did not sign but the score was correct in respect that the card he marked for his playing partner. In my opinion, it was not appropriate to disqualify the player in the circumstances described. The qualifying competition was over and none of the four exceptions in Rule 34-1b applied. The Committee was equally at fault at not recognising that the score card was not signed before they announced the qualifiers. There is nothing in the Rules of Golf that requires a prize winner to be present when the results are announced and the prizes awarded. The Committee may have introduced a condition of competition in this respect, but in my opinion this would be unacceptably draconian. I am not an expert on handicapping systems, which vary considerably around the world, but I would be surprised if a score card that was properly returned in a counting competition should not be valid for handicapping purposes, whatever the reason..